Excel to XPS Converter is a software product that dynamically converts MS Office,WordPerfect,HTML,AutoCAD DWG,PostScript,EPS,PDF,MS Visio and many other document types to XPS, PDF,PostScript,EPS, JPEG, TIFF, PNG, PCX and BMP etc formats. Excel to XPS Converter works in both GUI version and Command Line version. With Excel to XPS Converter you can convert your DOC files and to XPS, PDF, EPS, PS,JPEG,TIFF,BMP,PCX,PNG files easily. 15. 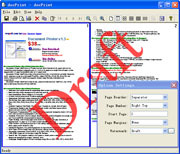 Create XPS, PCL, WMF, EMF, PDF, PS, EPS files.